Avenue. Please, Please share this post in Lachine. This cat (who goes by the name Bobo) was born in my backyard. His mother (Patches) is the only one he knows. She is in my backyard and looking for him. He is 14 months old. He weighs about 8 pounds, tiny, slim cat. 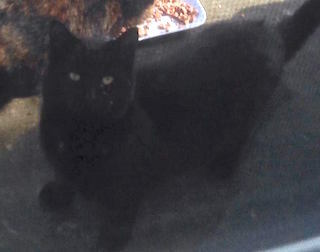 He is very friendly but Feral so he will not approach you. He does not fight with other cats. He is completely Black and his eyes are green. His eyes have been leaking since he was born so he may have Rhino. I beg of you, he needs to be back home in Lasalle with his mother. If you see him, please contact me, Aldo at 514-3651183. Please share this post. I need to bring him home. Next Post: Two oriental cats found in Laval – family found! We have reason to believe that he is still around that area. Please call 514-365-1183 with Any info..Thank you in advance. mais malheureusement, il est pas lui. Merci Beaucoup. March 30th, 2016 Bobo is still being actively looked for! Update October 23rd. he is near/around Sir George Simpson street. Near a Church. The most reported sightings are between 49ave. And 53rd ave. between Sir George Simpson and Sherbrooke in Lachine. If you live near those areas, please be on the lookout for Bobo. He’s all black with green eyes. Thank you. Thank you Pamela. We were searching for close to three hours last Night. We will search this area. Yes, please let me know if anyone may see him again. He must be scared. Thank you. 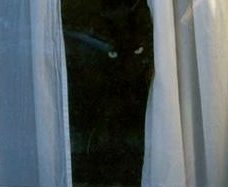 I have a friend who lives on 45th ave in Lachine She saw a Black cat that fit your description of BoBo Monday this week. He was running around on 54th and Sir George Simpson. she went out again today to see if she could spot him but know luck so far. Will keep you posted.